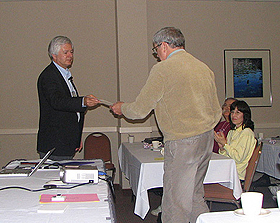 Marv Baldwin accepts his award for reaching 150,000 visual observations. 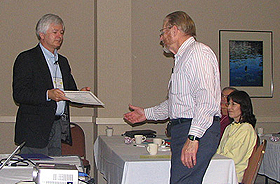 Christopher Hesseltine receives an award for reaching over 10,000 PEP/CCD observations. * Years include total AAVSO observing interval (not only PEP or CCD observing). Total includes PEP and/or CCD observations only (not observer's visual contributions).